Dundee City Council required access to the roof of Clepington Primary School to carry out roofing repairs after leaks appeared following a bout of bad weather. The scaffold was a tall scaffold construction, standing at 7 storeys high and as tools and materials were required to be carried to the top of the scaffold a stair access was provided. The project also required a quick turnaround as all works were to be completed and cleared over the Dundee School holidays. 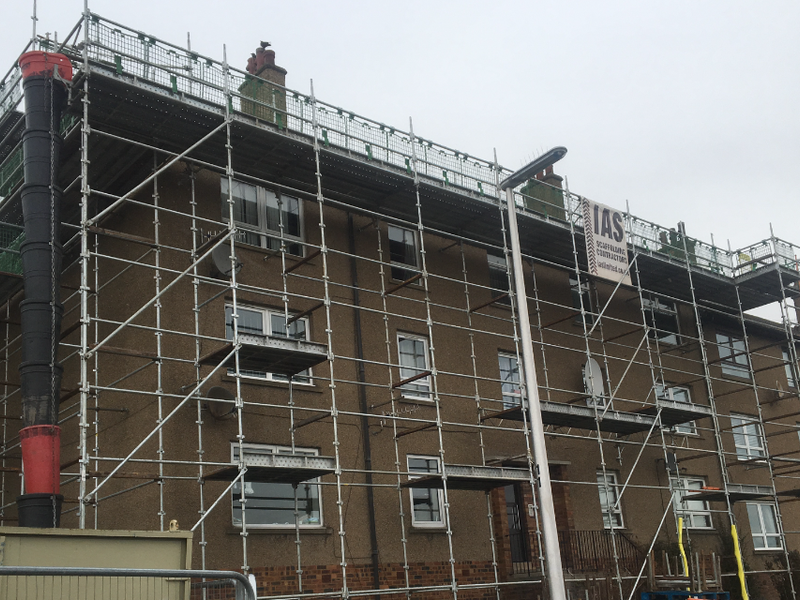 As part of Dundee City Councils remediation programme to council housing scaffolding was required to be erected across Dundee to allow roofers to carry out repair works on a number of tenement blocks. Shown here is one section of scaffold, showing the working lift at the gutter height of the structure and also a waste chute to allow the trades working on the roof to safely discard any waste produced down to a skip on the ground elevation without posing a hazard to residents walking nearby. Shown here is another section of roofing works carried out for Dundee City Council at Pentland Crescent, Dundee. 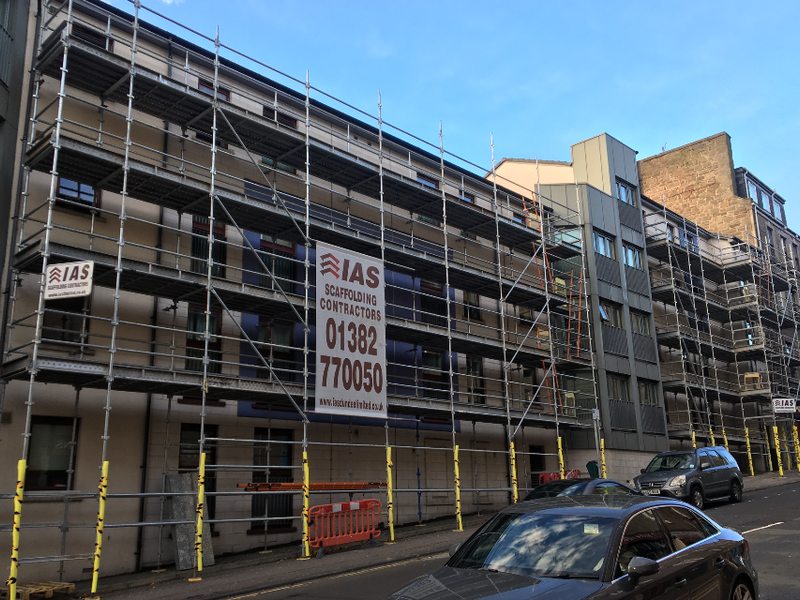 Perimeter scaffold was erected to all elevations of flats located on Albert Street/Victoria Road junction to allow Bell Group to safely replace the windows on all elevations. 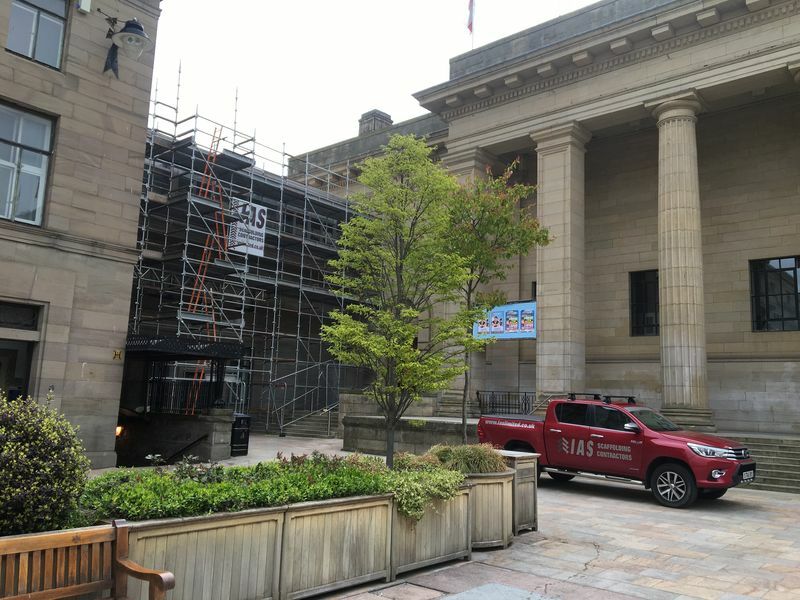 The scaffold was on a prominent street in Dundee and required access to be maintained on the footpath underneath the scaffold for pedestrians, with padding secured to the standard legs to protect members of the public. The Caird hall is the main centre for events and functions in Dundee and is located directly in the city square. 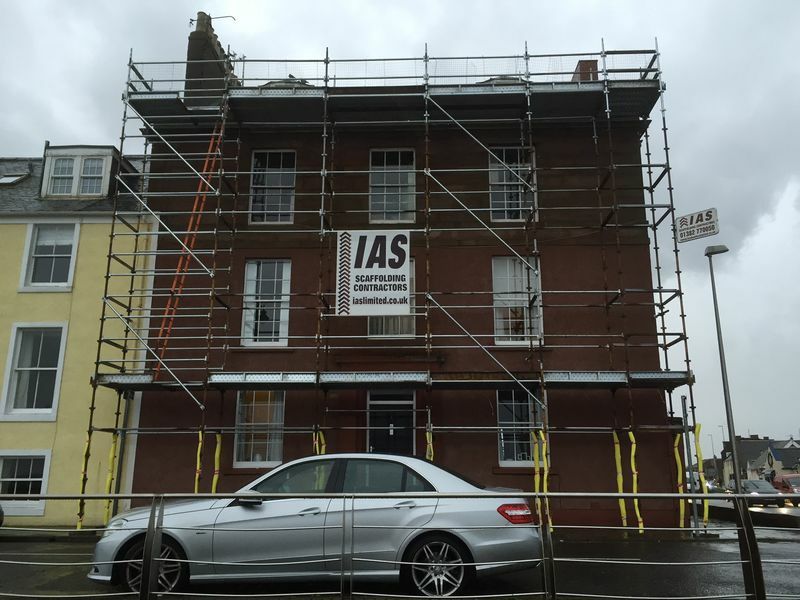 IAS Dundee ltd provided the scaffolding to carry out remedial works to the building. 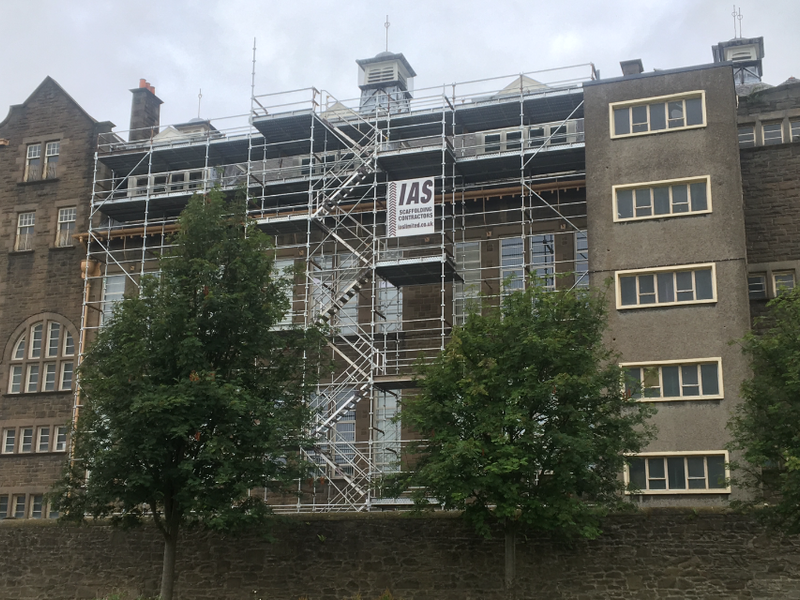 Seen here is a section of the scaffold showing a ladder access tower and a section of scaffold beamed over a stairway entrance to the courtyard to ensure pedestrian access was maintained through the stairwell at all times throughout the works. 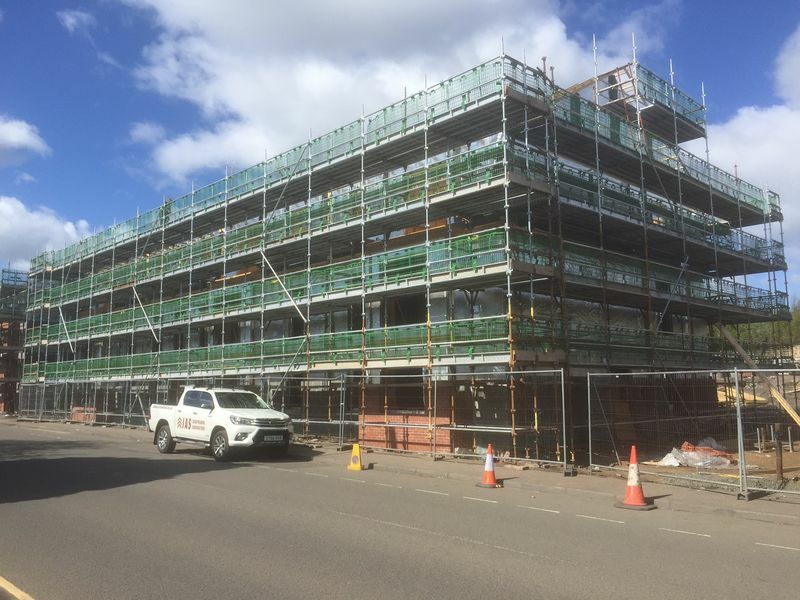 Shown here is a scaffold erected for Robertson Construction to construct new student accommodation blocks at Causewayend, Aberdeen. The exterior scaffold face is covered in netting to minimise noise and dust produced from the construction activities from interacting with the public as they walk by. The photo also shows the provision of a loading bay, with a scaffold crash deck underneath to catch any falling materials and act as an enhancing barrier of safety. 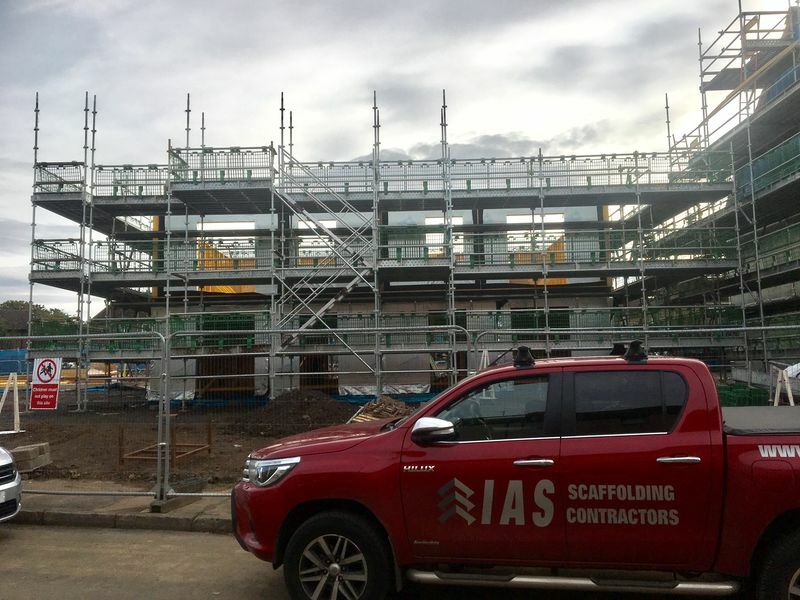 IAS Scaffolding was utilised in the construction of a new housing complex at Victoria Street, Kirkaldy for KJJ Properties. 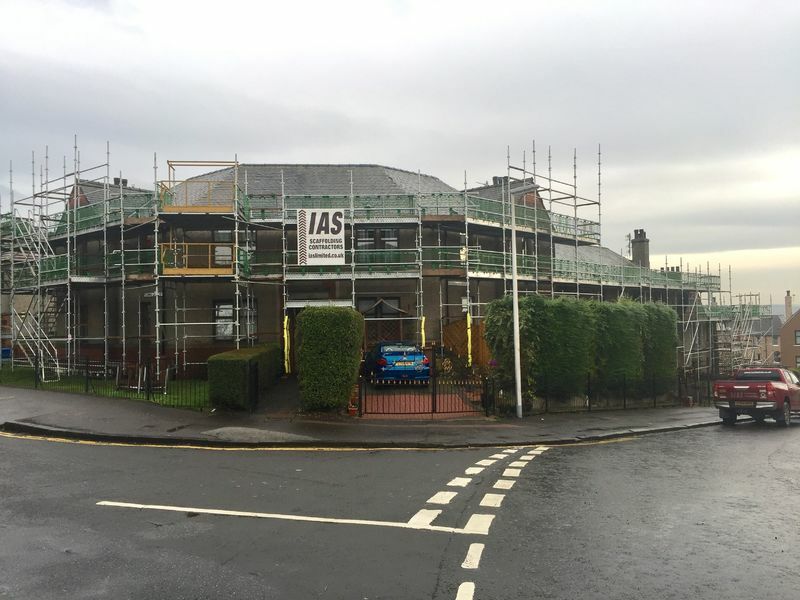 This photo shows more roof replacement works carried out in Dundee with the scaffolding provided by IAS. Another photo of Dundee City Council’s roof replacement project with the scaffolding works carried out by IAS Dundee. The oldest photo in the IAS collection but a flagship project that was carried out in 2011. The scaffold fully encapsulated the old home of Dundee City Council, Tayside House. As part of the of Dundee City Councils Waterfront re-development project the tower was to be demolished to construct Slessor Gardens, a new open garden music venue. 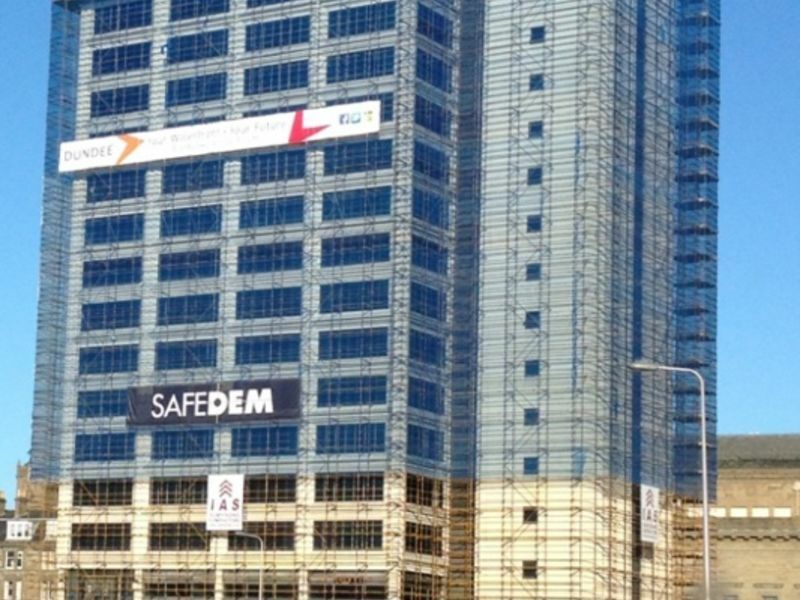 The scaffolding fully surrounded the 18-storey building and allowed for piecemeal demolition of the structure. 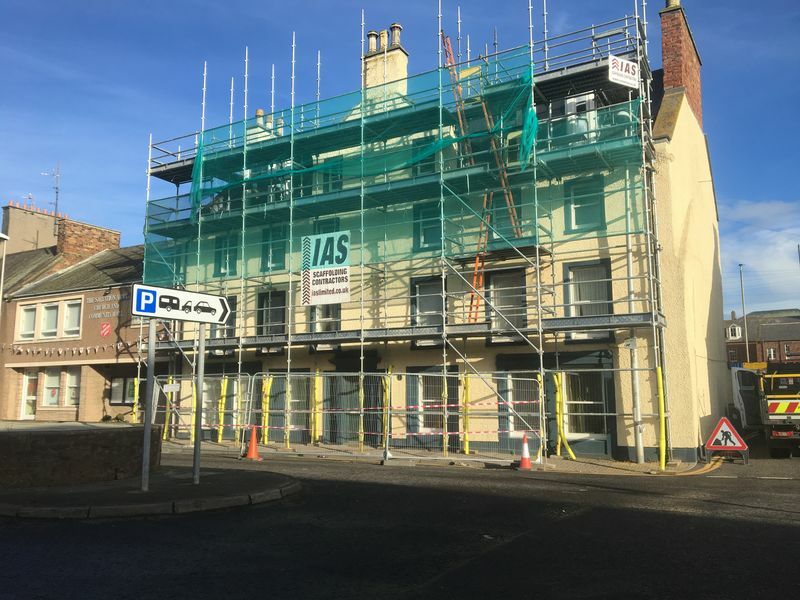 Scaffold was required for remedial works to the windows and roof of the existing property. Debris netter was utilised to prevent small fragments of debris from projecting from the working platforms and entering the public domain. This alongside the use of a protective crash deck ensured that the passing public of Forfar were safe throughout the works. 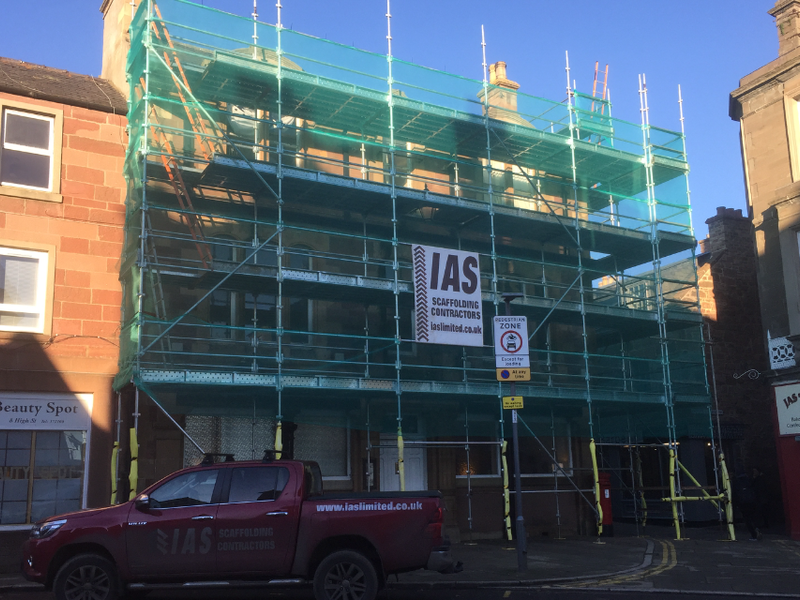 Another project by IAS Dundee to allow a roofing contractor safe access to the roof of the property to carry out maintenance and repair works. Another scaffold that required access to the public to be maintained and for pedestrians to be protected by utilising a protective crash deck. A new housing complex currently constructed in Inverurie near Aberdeen by Cala Homes. The site is a large-scale housing project constructing a high-quality housing scheme – which in turn required high quality scaffolding. Our galvanised Kwikstage system scaffold was highly regarded by the client. Currently across Scotland Exterior Wall Insulation is being provided to existing council houses by SSE. 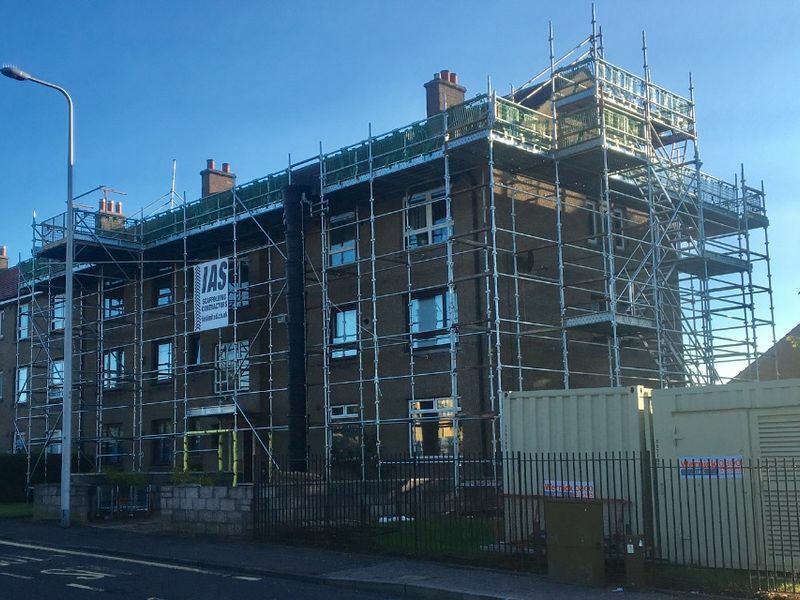 Here the client, Insulated Render Systems are carrying out the work and this photo shows one of their large scale EWI project at Moncur Crescent, Dundee at the top of the Hilltown. 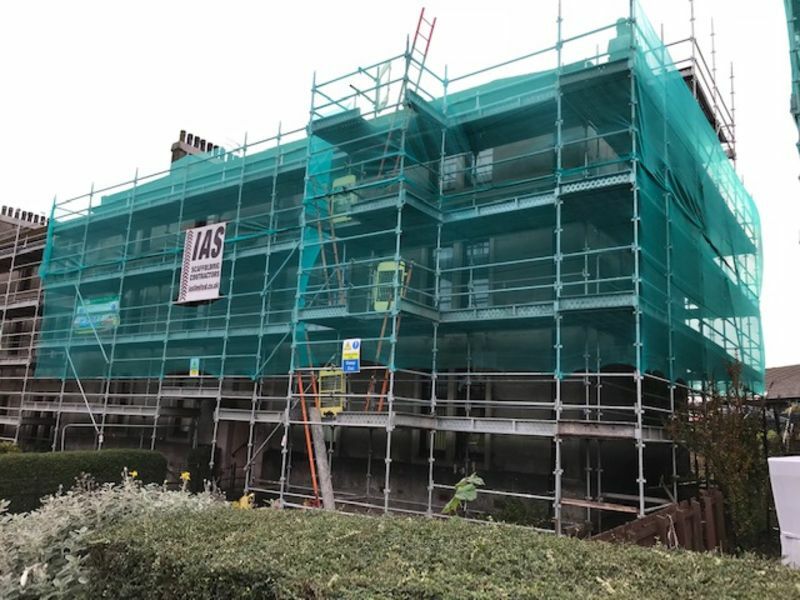 Here we provide a safe working platform to 4 blocks of council flats so that insulation boards can be fixed to the exterior face of the existing walls before they are covered in fresh render. This is part of SSE’s project to increase the insulation levels on council properties and reduce heating costs of the customers. 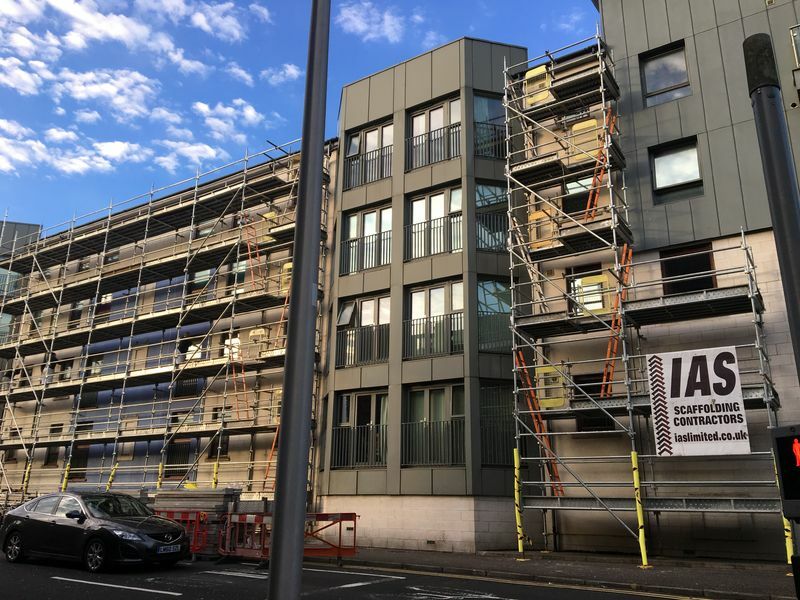 One of the largest projects IAS have completed recently was the project by Esk Glazing to replace every window on the Dundee and Angus College, Dundee. 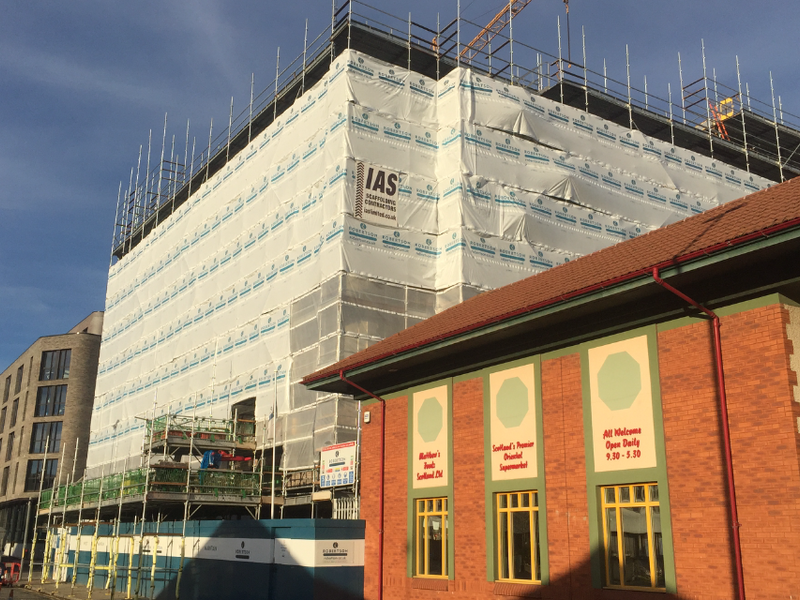 The 7-storey structure’s perimeter was fully surrounded in scaffolding whilst maintaining access to the building for students and staff. The project was clearly visible from Dundee’s main through road the Kingsway. Shown here is a standard scaffold erected for a two-storey home extension in Newtyle, Angus. 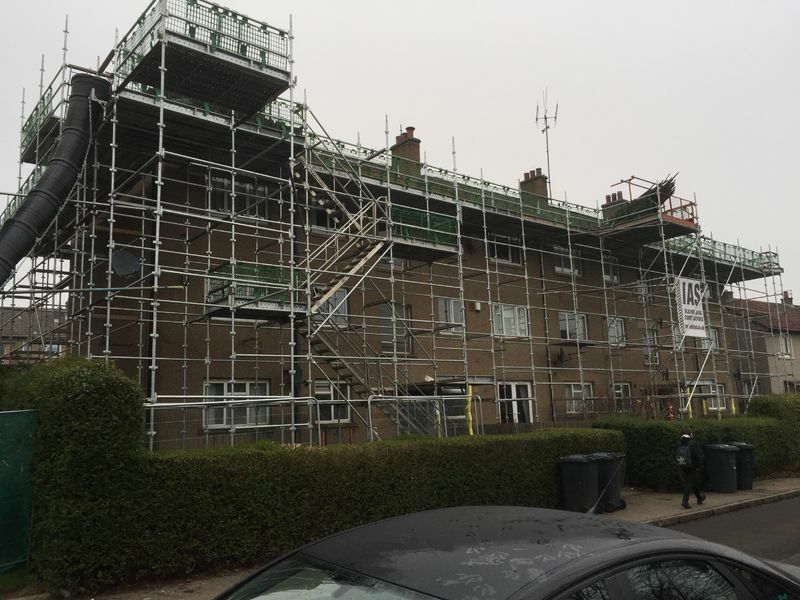 This photo shows a classic residential scaffold project carried out for the homeowner to allow the private tradesmen to carry out their work. Shown here is scaffolding set up for a local roofing contractor, McLean Roofing. This was a full perimeter scaffold on the tower of an old Victorian house with the ladder bays through the scaffold and complete with a ginwheel at the top working lift. Following a period of high winds emergency repairs were reuired to fix the exterior cladding on the RBS building in Forfay. This required us to act on short notice to ensure the scaffold was erected in order to prevent an accidet. IAS aim to respond to emergency works in 24hours as safety is one of our core values. This photograph shows scaffolding erected around the perimeter of the historical Tower O'Ess in Aberdeenshire to allow access for stonemasons and roofworks to conert the dissused watchtower into residential properties.